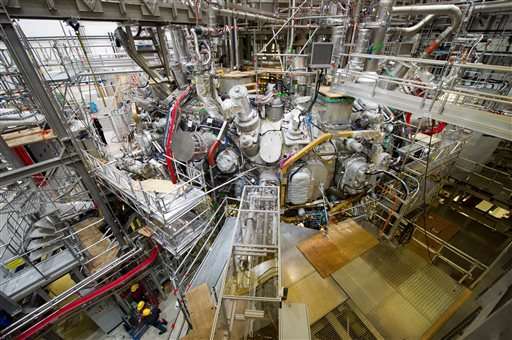 Scientists in northeast Germany were poised to flip the switch Wednesday on an experiment they hope will advance the quest for nuclear fusion, considered a clean and safe form of nuclear power. Researchers at the Max Planck Institute in Greifswald planned to inject a tiny amount of hydrogen and heat it until it becomes a super-hot gas known as plasma, mimicking conditions inside the sun. It's part of a world-wide effort to harness nuclear fusion, a process in which atoms join at extremely high temperatures and release large amounts of energy. Advocates acknowledge that the technology is probably many decades away, but argue that—once achieved—it could replace fossil fuels and conventional nuclear fission reactors. Known as the Wendelstein 7-X stellarator, or W7-X, the 400-million-euro ($435 million) device was first fired up in December using helium, which is easier to heat. Helium also has the advantage of "cleaning" any minute dirt particles left behind during the construction of the device. While critics have said the pursuit of nuclear fusion is an expensive waste of money that could be better spent on other projects, Germany has forged ahead in funding the Greifswald project, costs for which have reached €1.06 billion euros in the past 20 years if staff salaries are included. Chancellor Angela Merkel, who holds a doctorate in physics, is expected to attend Wednesday's event, which takes place in her constituency. Over the coming years W7-X, which isn't designed to produce any energy itself, will test many of the extreme conditions such devices will be subjected to if they are ever to generate power, said John Jelonnek, a physicists at the Karlsruhe Institute of Technology, Germany. 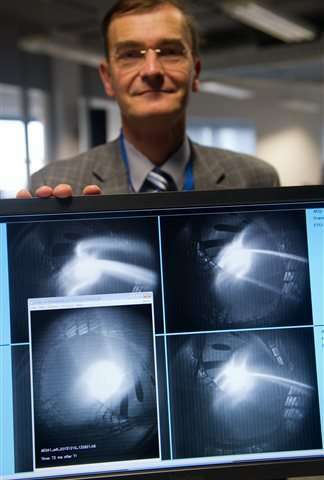 Jelonnek's team is responsible for a key component of the device, the massive microwave ovens that will turn hydrogen into plasma, eventually reaching 100 million degrees Celsius (180 million Fahrenheit). Compared to nuclear fission, which produces huge amounts of radioactive material that will be around for thousands of years, the waste from nuclear fusion would be negligible, he said. "It's a very clean source of power, the cleanest you could possibly wish for. We're not doing this for us, but for our children and grandchildren." Umm... 100,000,000 degree Celsius = 180,000,032 degree Fahrenheit, not 212,000,000 degree Fahrenheit. You have to ask why anybody would try to convert anything to Fahrenheit; nobody uses it anymore.